1. 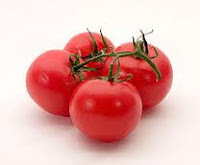 Tomato enriched with vitamin C, a nutrient that keeps your immune system stay strong. 2. Tomatoes contain phytonutrients (nutrients derived from plants including fruit) called lycopene which has been shown in several studies to have anti-aging and anti-cancer properties. Lycopene is effective against prostate and colon cancer. Lycopene contained in tomatoes also helps fight damage to genes that could potentially cause illness. 3. Tomato stimulate the formation of amino acids that are proven in research karnitina accelerate fat burning in the body more than 30 percent. Research shows that lycopene contained in tomatoes, if consumed regularly, can reduce the risk of heart attack by 29 percent. Lack of intake of lycopene in foods consumed postmenopausal women is associated with osteoporosis. 5. Tomatoes also contain other phytonutrients, including beta-carotene, lutein, and zeaxanthin, which are good for the eyes and helps protect your eyes from degeneration. 6. Tomatoes are delicious and versatile. Tomatoes can be combined in pasta, salads, soups, curries, stews, and a variety of your favorite dishes. Part of the said tomatoes should be eaten after cooking to get maximum nutrition. That's not entirely true. Although lycopene is absorbed most of the tomatoes are cooked, vitamin C and other enzymes contained in most tomatoes contained in tomatoes that are not cooked.